I am sure you all remember when I announced the arrival of Chhori into our lives. I am sorry to tell you all that 22 months has already passed since then and you have all grown older . 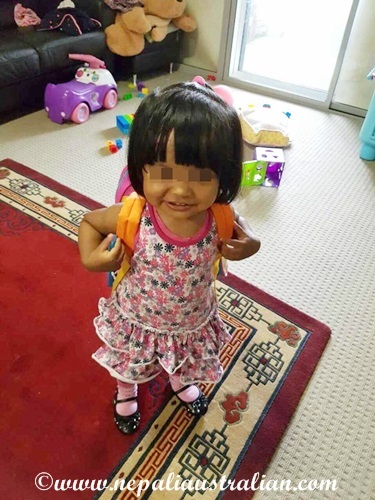 Yap Chhori is 22 months old now and has stared childcare from last Friday. And it was a big milestone for us as well. We had planned the day in advance and both AS and I had taken the day off. As I mentioned in my previous post, when we went for a visit to the childcare, she refused to come home but we were not sure how she would handle being there for a whole day. I have to admit, I was more nervous than anything. I was worried if the teachers will understand her needs and how they will feed her. I think being a mother; it was harder to leave her with complete strangers for a whole day. I know every parent has to go through this and we were lucky to have my parents to help out until now. The big day finally arrived. That morning, I just told her she is going to go to school today. I don’t know how much she understood but she seemed excited (it could just have been because we were going out). She ate her breakfast and happily allowed me to change her clothes and was more than happy to carry her bag. As we were leaving, she wanted to take her toys with her including the baby shopping cart. We explained to her that the toys can’t go with her but there will be lots of new toys at the childcare and she was OK to leave them at home. It was very emotional for me to see our daughter become a toddler and so independent but at the same time I was very proud of her. We told the teacher to call us if anything came up and we can come back to pick her up anytime. At noon as there had been no calls from the childcare I called to check if everything was ok. The reply was she is doing really well, had her snacks and meals and a nap. Not a tear for the whole day. So we decided to go and pick her up at the end of the day only so that she would get used to the whole day care. When we went to pick her up, she seemed happy. She had biscuits in each hand. She came to us said “Mama” and “Papa” and kissed me. I was really happy to hear good reviews form her teacher. She was well behaved the whole day and enjoyed her first day of childcare. Please share your own experience of childcare and any suggestions you have for this anxious mother to make her stay there better. 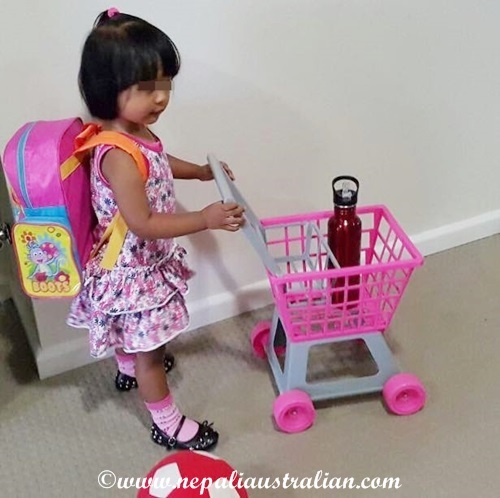 This entry was posted in Being Mum, Our daughter and tagged australian, australian nepali, child care, grandparents, M from nepaliaustralian, money, mum, Nepal, Nepalese, Nepali, nepali australian, Nepali blog, Nepaliaustralian, parents. Bookmark the permalink. Chhori is an amazing little girl, dear. You have raised her to be social and is so smart! It is always difficult to say goodbye to your child and be worried about how they are coping. Children are generally quite adaptable and separating is a normal part of growing up. Trust your gut feeling as a parent. If you child is happy when you pick them up, the centre is well run. Most kids find their way and learn the very important socialization process at child care before they even get to school. Thus they will be prepared for life and education. Sounds like you’ve done a fantastic job with her! She’s well adjusted and ready for the world! Well done mom and dad! Happy new year! Oh congratulations. Wish we would get a childcare spot in Germany as well! We do have waiting time for childcare here too but I guess not as bad as there. I remember my days at the nursery. I best loved the games we used to play. Australian, I love that picture on your wall. Did you get it in Thamel ? Ohoo, she is younger than my daughter so I can understand why she has the issue. I am just glad Chhori was happy to be there. If she had cried, it would have made it harder for me to leave her there. I am sure in time your daughter will like it there and will be happy to say bye to you.